The first time I made this recipe, I measured the flour rather than weighing it. 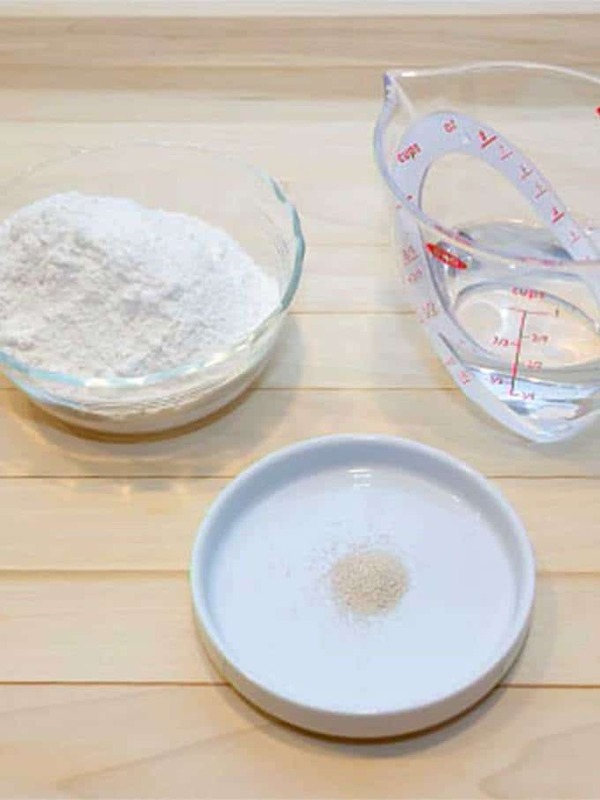 This was a big mistake since a cup of my measured flour weighed almost six ounces compared to the King Arthur weight of 4.25 ounces. Needless to say, I had to add a lot more water. While the resultant bread was really good, it didn’t seem the way to go. Ultimately, I decided that the only way to produce a consistent product was to weigh everything! I began by making a starter the night before. The starter has equal parts of bread flour and water, and a very small amount of yeast. First, I mixed the bread flour, water, and yeast in a small bowl until combined. Then, I dumped it into the pan of the bread machine and closed the lid for the overnight “activity”. At first, I was concerned that I should cover the pan with plastic wrap since the top of the bread machine is vented. As it turns out, this is not necessary. 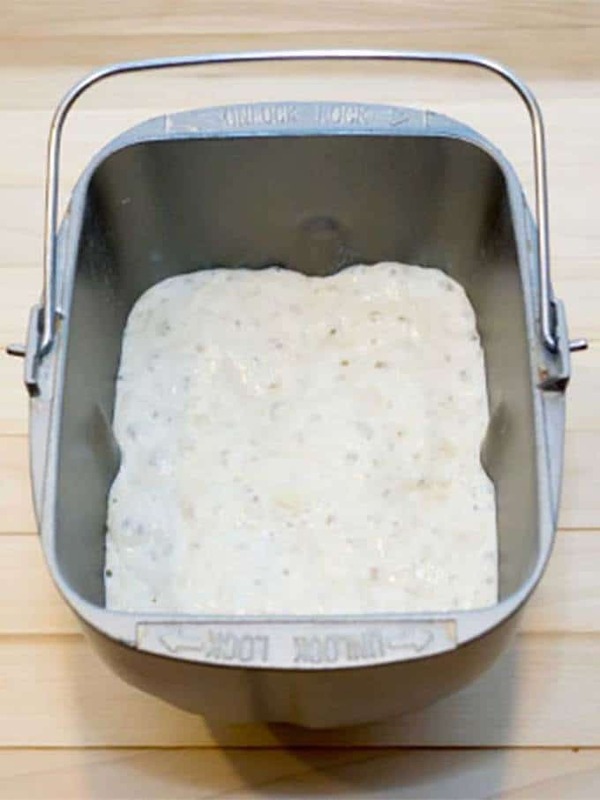 The next morning, the starter was bubbly and ready to use. I’m constantly amazed at what the starter looks like given the small amount of yeast. 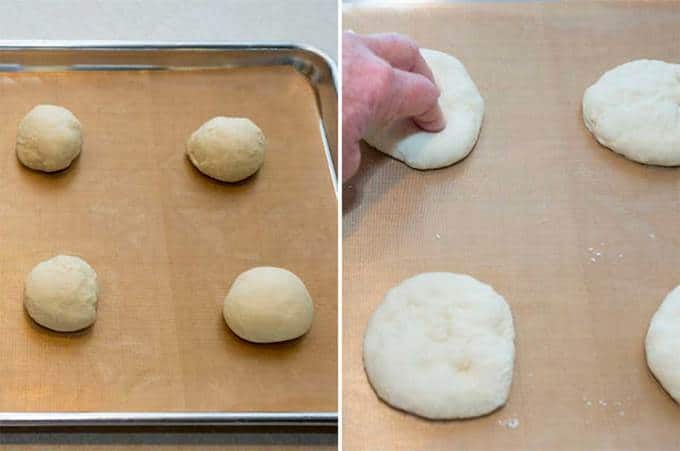 I used the following ingredients for the actual rolls: The starter, Kosher salt, water, bread flour, and some additional yeast. I added these to the pan of the bread machine in the order listed. Then, I set set the bread machine to the dough cycle. After the dough cycle finished, I removed the dough to a floured piece of parchment paper. I used a pizza cutter to cut the dough into 2 to 2.25 ounce pieces. Then, I stretched each piece several times and formed it into a ball. Next, I placed on a parchment lined baking sheet. Finally, I used my floured fingertips to flatten the balls. The reason that I do this is that I prefer the rolls when they’re a bit more spread out. 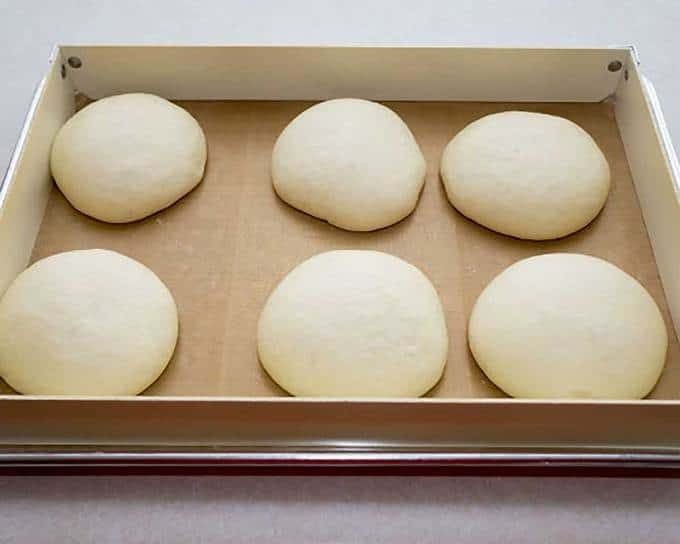 During my experimenting, I discovered that if I covered the baking sheet with another one before letting the rolls rise, the results were significantly better as shown in the picture below. The roll on the left rose and was cooked without being covered. The roll on the right was covered during the rise and for the first ten minutes of cooking. It was sometimes tricky, however, to keep the top baking sheet aligned to the bottom one. To solve this problem, I used a pan extender which Susan got me several Christmases ago. The additional baking sheet fit perfectly on top of the pan extender. Following Julia Child’s advice, I use my electric oven which has been turned on for 1 minute and 45 seconds to create a warm environment in which the rolls can rise. 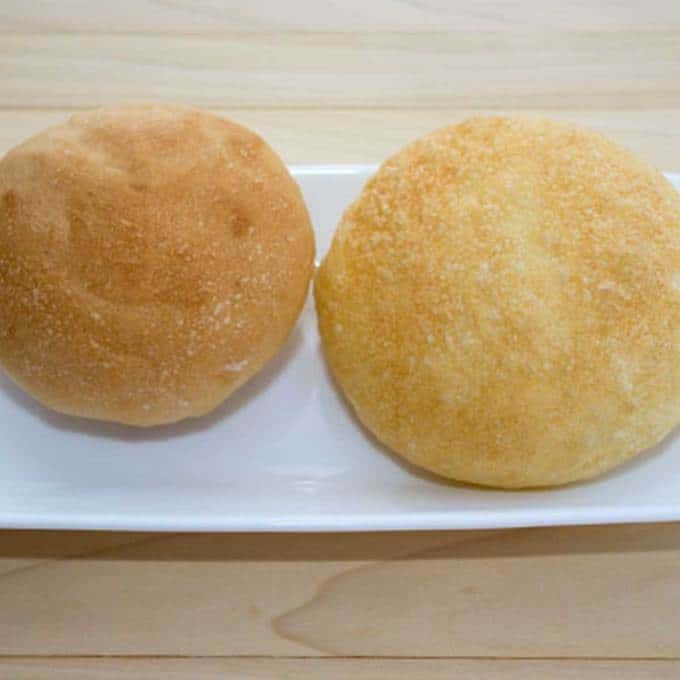 Because the rolls don’t contain that much yeast, it takes several hours for them to reach proper size. Once the rolls had reached the proper size, I baked them for 10 minutes in a preheated 400° F oven with the cake extender and top baking sheet. My logic here is that the covered pan creates a “steam” type of environment. After 10 minutes, I removed the top baking sheet and pan extender and baked the rolls for an additional 10 minutes. 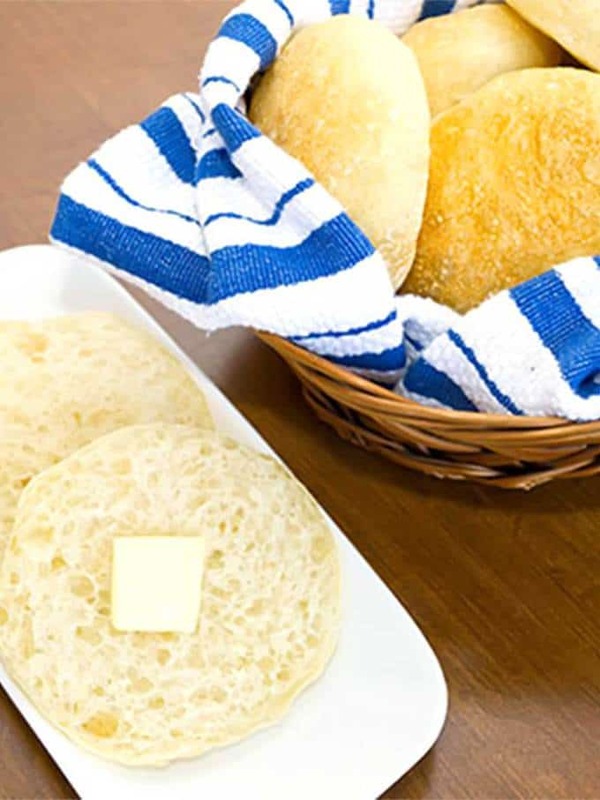 Once they had cooled on a wire rack, these delicious rolls are ready to serve. (Go here to see how to fold a regular kitchen towel for a basket insert.) Yum! Combine all ingredients in a small bowl; stir until combined. Transfer to bread machine. Let sit at room temperature for 14 to 18 hours. Add the water, salt, bread flour and yeast to the starter in the pan of the bread machine. Program the machine for the dough cycle, and press start. 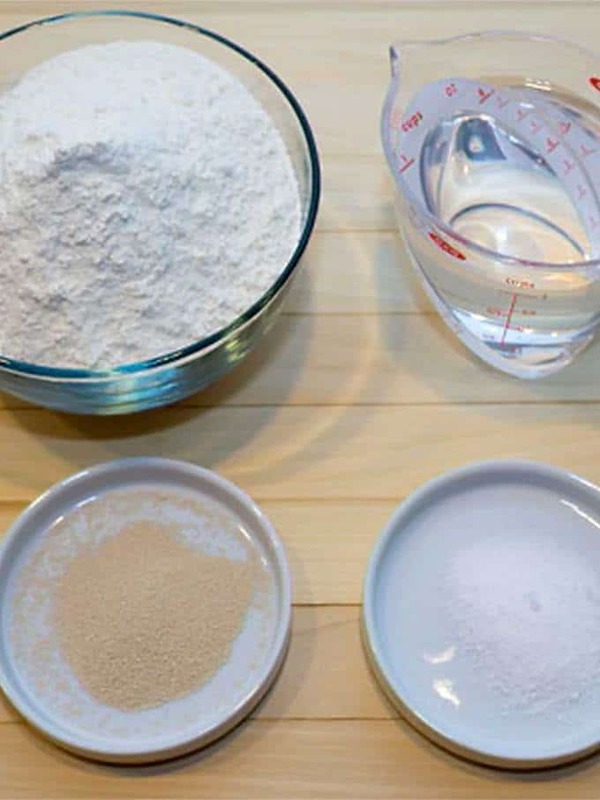 When the dough cycle has finished, transfer the dough to a floured surface. Using either a pizza cutter or a dough scrapper, cut the dough into 2 to 2.25-ounce pieces. Form each piece into a ball and place on parchment lined baking sheet. Using floured fingertips, flatten each piece until it is about 1/2-inch thick. Allow to rise, covered with a baking sheet, in a warm place* until tripled in size, about 3 hours. Preheat oven to 400°F. Bake 20 minutes, or until golden brown. Remove from oven; transfer to wire rack to cool. 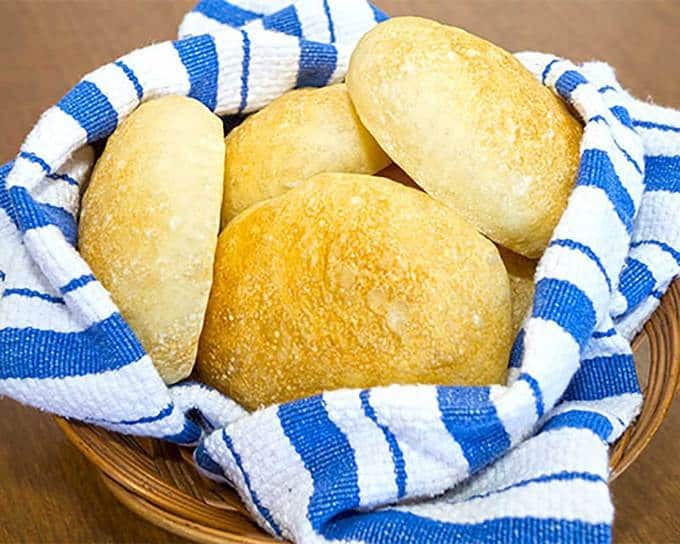 Yield 15 french bread rolls. *To create the perfect environment for rising, turn on electric oven for 1 minute and 45 seconds.